Al Pacino (Al) is a 16.1HH 17 year old bay gelding. 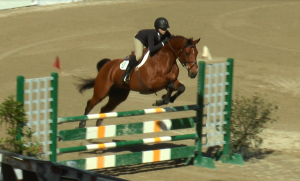 He is a Holsteiner showing in high child/adult jumper and up to 3’6″ equitation divisions. Al has a successful career competing at the highest show jumping levels and won 2017’s Middle Tennessee Hunter Jumper Association High Child/Ad Jumper and 2018’s 3’3″ Equitation Annual Championship awards. Al is an easy keeper, always sound and has a super sweet personality with exceptional ground manners. For show record, view USEF #5238791 and MTHJA #2464.